RHYTHM AND BLUES in the Pacific Northwest would require an entire book to explore. In a complete history we would get to look back at many great black (and white) singers and musicians from this region. Reviewing the names of some of these obscure R&B combos and doo-wop groups from earlier decades certainly evokes images of a bygone era of wonderfully soulful music: Chuck Moore & the Allstars, Lanny Hunt & the Majestics, Billy Larkin & the Delegates all worked out of Portland, Oregon in the 1950s and ‘60s. Meanwhile, Yakima, Washington, had Harper Morrison & the Silvertones, and Tacoma had the Barons, Skylarks, Parking Meters, Elegants, Willie Washington & the Titans, and Bobby Shorter & the Innkeepers. Seattle had the Dave Lewis Combo, Ron Holden & the Playboys, the Don Mallory Combo, Gallahads, Shades, Mello-aires, Tiny Tony & the Statics, Jimmy Pipkin & the Boss Five, and James Thomas & His Tomcats, among many others. The Northwest’s R&B scene also produced a number of artists who have achieved lasting fame including guitar aces Jimi Hendrix and Robert Cray. Though certain details surrounding the national origins of R&B music may have been lost in the mists of time, its genesis on a regional level here in the Northwest is quite clear: the very first local rhythm and blues recording of note from Seattle – “Confession Blues” (Downbeat Records #171) – was cut by the Maxin Trio in a downtown radio station studio in 1948. THE MAXIN TRIO: The Maxin Trio – also (inaccurately) noted elsewhere as the “Maxine” or “Maxim” Trio – held a regular gig throughout 1948 and into ’49 at the Rocking Chair, one of the many afterhours jazz rooms that contributed to Seattle’s infamous Jackson Street jazz scene in the postwar period. There were numerous other ensembles comprised of African-American musicians working the scene, including the Oscar Holden Quintet, the Zak Harris Combo and bands led by Pops Buford, Joe Gauff, and Roberts “Bumps” Blackwell. 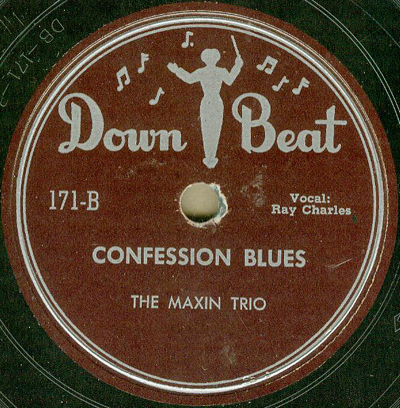 But, because they dosed their sets with a heapin’ helpin’ of downhome blues, the Maxin Trio stood out from the pack of local cocktail jazzers and became a remarkably influential musical force in the area. Eventually the trio would cut about 40 tracks for a Los-Angels –based label including a happy blues that was written for, or about, their friends in Seattle. It’s title? “Rockin’ Chair Blues.” By ’52 the Maxin Trio’s pianist/singer R.C. Robinson went solo, signed with Atlantic Records, and proceeded to cut a string of innovative hits that would essentially redefine R&B/ Soul music. Those later accomplishments were, of course, made his new stage name: Ray Charles. BIG JAY McNEELY: A west coast R&B saxophone honker, Big Jay McNeely, recorded what remains his most memorable number – the classic “There Is Something On Your Mind” – in a tiny home studio in Seattle in 1957. Back in those days very few local radio stations programmed or supported big-beat music of any type. There was, nevertheless, quite a strong nightclub scene around the area. Many of the most legendary names in early 1950s rhythm and blues found work in Portland, Vancouver B.C., and Seattle/Tacoma nightspots. McNeely’s band occasionally got bookings in Seattle rooms such as Dave’s 5th Avenue or Birdland for several weeklong engagements. Prior to one of these stays, he contacted Tom Ogilvy, a local pop songwriter and recording enthusiast. Ogilvy quickly arranged to take McNeely’s combo to his friend Joe Boles’ basement studio in West Seattle. The session produced a number of quality original tunes, but all those present agreed that releasing any of the songs on Ogilvy’s Seafair label would be futile given the realities of Northwest radio. So, upon the completion of his gig in town, McNeely packed up the Master Tapes and hit the road back to Los Angeles. When he eventually contacted Hunter Hancock – then L.A.’s top R&B disc jockey – and played him the tapes, Hancock offered to form a label and release them himself. Helped immensely by the airplay that Hancock was in the position to provide on his popular daily show, Huntin’ With Hunter, the first single “There Is Something On Your Mind,” (Swingin Records 614) was released on February 17, 1959. The song quickly climbed to the No.5 slot on Billboard magazine’s R&B charts, becoming one of the top-selling R&B songs of that year. Originally formed in the early 1950s as the Southwinds, this 5-man vocal group began by performing strictly gospel-oriented music. Strictly, that is, until they crossed paths with a red-hot fireball of a rockin’ rhythm and blues singer named Joe Boot. From that point on, group members would ever be torn between spirituals and R&B. A compromise was struck and they added Boot, renamed themselves the Fabulous Winds, and proceeded to work up a mixed repertoire of tunes. While retaining some of their devout members, the Winds worked out vocal arrangements for pop standards and eventually some of Boot’s originals. By 1957 the Winds found themselves at one of Seattle’s pioneering recording studios, Dimensional Sound. Numerous sessions were held there with instrumental backing by the Floyd Standifer Orchestra. Boot seemed to know all of the top African-American stars who passed through town and on one occasion in the fall of ’57 none other than Little Richard Penniman stopped by a session at Dimensional and announced that he had just given up rock ‘n’ roll and returned to religion. Furthermore, having just abandoned his international rock tour, Penniman said that he as going to appear down the street at the Moore Theater to spread the Good Word at a revival show. After a quick prayer with Penniman, the Winds agreed to appear at that show. But, unlike his sold-out dates in previous visits to Seattle – including a blistering matinee show at the Eagles Auditorium that very summer – Penniman’s Moore show was, reportedly, very poorly attended. 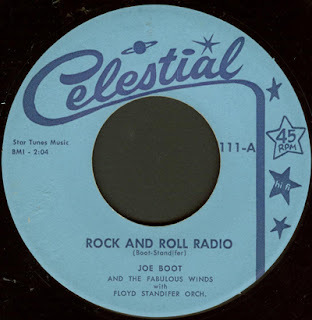 Joe Boot and the Fabulous Winds, however, went on to cut what was most probably the very first rock ‘n’ roll record ever produced in the Pacific Northwest. Issued by Dimensional’s in-house label, Celestial Records, “Rock and Roll Radio” / “That’s Tough,” remains an ultra-rare, but essential, regional classic.